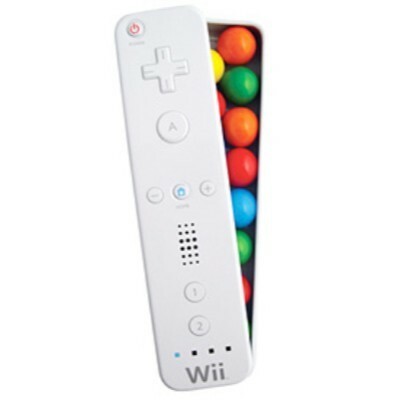 The delicious Wii-mote-inspired candy! Enjoy these entertaining gumball treats encased in a tin inspired by the design of the classic white Wii controller. Caution: although this entertaining novelty doesn’t require batteries, it will still break your tv screen if thrown in anger after a high stakes round of Mariokart (we’ve checked). Dextrose, Sucrose, gum base, glucose syrup, artificial flavors, acidity regulator E330, modified starch, colors E129*-E102*-E133-E171, glazing agent E903, antioxidant E321. *May have an adverse effect on activity and attention in children. Contains GMO. Nutrition facts (for 100g): calories 321Kcal, total fat 0g (saturated fat 0g), total carbohydrate 89.7g (sugar 76.9g), protein 0g, salt 0g.